The developing gut of a zebrafish, magnified. Our intestine is a highly complex organ – a tortuous, rugged channel built of many specialized cell-types and coated with a protective, slimy matrix. Yet the intestine begins as a simple tube consisting of a central lumen lined by a sheet of epithelial cells, which are smooth cells that lie on the surface of the lumen. These intestinal epithelial cells are central players in many human diseases. Daniel Levic of the Bagnat Lab is using zebrafish as experimental models to understand how intestines are formed in hopes of finding new ways to combat disease. 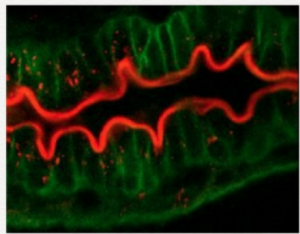 He wants to learn how the intestinal lumen forms during early development, and how intestinal epithelial cells take on their physiological functions. Levic, a postdoctoral research associate in the department of cell biology at the Duke University Medical Center, focuses on projects in both basic and translational science. Daniel uses zebrafish to analyze the formation of the lumen and the polarity of epithelial cells—how specialized they are for carrying out different functions— at the genetic and cellular level. He focuses on how membrane proteins are sorted into different, specialized domains of the cell surface and how this process affects intestinal formation. Additionally, Daniel studies how inflammation is evaded in intestinal epithelial cells in Crohn's disease using a combination of patient biopsy samples and animal studies in zebrafish. This project is a collaborative effort aided by clinicians and human geneticists at the Duke University Medical Center. Though complex human diseases can't be fully mimicked in animal models like zebrafish, this type of research can be extremely useful. These model organisms can be used to study the basic, fundamental cellular mechanisms that ultimately underlie disease. An example is Daniel's work on Crohn's disease, where he is trying to understand how inflammatory signaling networks become activated, specifically in intestinal epithelial cells. This problem is difficult, if not impossible, to address using exclusively human biopsy samples. Overall, Daniel hopes that his translational research will provide new knowledge of the role of intestinal epithelial cells in Crohn's disease and provide biomarkers that will aid clinicians in predicting how patients will respond to therapeutic interventions. Daniel's research and basic science research are rapidly changing the way we diagnose disease, treat patients, and interact with the world around us.